Mayo. This is another one of those things I never considered making in my own kitchen until recently, but the result is fantastic and the process isn’t hard. I have yet to find a truly “clean” store-bought mayo. All the common brands contain terrible ingredients…. high fructose corn syrup, modified corn starch, sugar, soybean oil, and canola oil. By the way, every single one of those ingredients I just listed come from genetically modified crops…. when you see those ingredients listed, put it back on the shelf and learn to make it yourself. Seriously. That stuff freaks me out. 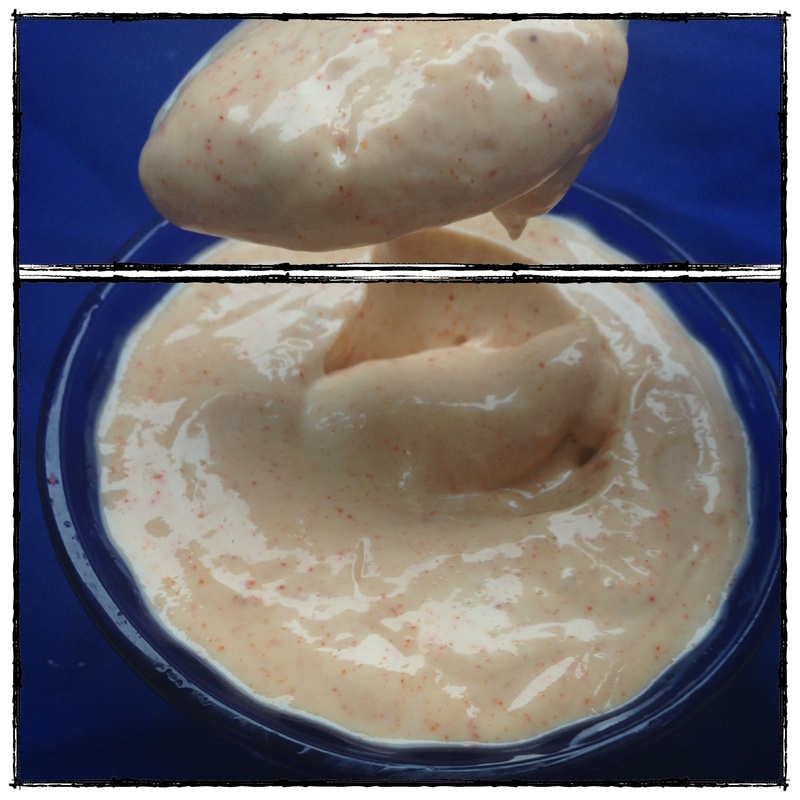 Ok, so homemade mayo is made with just 6 ingredients, all of them good. Olive oil (good fat, non-GMO), eggs (organic and pastured is best…. amazing nutrients and protein, not to mention full of those beneficial Omega-3’s), vinegar, mustard, and some spices. That’s it. Now, while the texture is quite “mayonnaise-like” this doesn’t taste like an exact replica of that gross stuff I used to eat. It is so much better. You can spread this on sandwiches to be sure, and mix it into tuna or egg salad, but you can also do so much more. One time, I folded in fresh basil, roasted peppers, and garlic to make more of an aoili that we dipped veggies in and spooned onto our fish. Another time, I added some dried spices and a little bit of coconut milk, and got something that tasted freakishly like ranch dressing. The possibilities are endless, really. This morning I added in chipotle seasoning, and smoke paprika and dipped homemade sweet potato fries in it. See? Endless. I would love to hear what some of you lovely people create!! Additionally, I know that some of you will freak about consuming raw eggs. I would freak too if I didn’t trust my farmer… There is such peace of mind in knowing where your food comes from, what conditions the animals are raised in, the foods they consume, and the freshness of the product. I get my eggs from this amazing woman named Eiko, with Skagit River Ranch. The eggs are organic, pastured, and the freshest eggs ever. I have to wait in line to get these eggs, and pay a pretty penny for them, but to our family it is worth it. Personally, I would be fearful of eating raw eggs from almost any other source. AND, if you are pregnant or nursing, don’t eat raw eggs. But you already knew that. This recipe fills up one mason jar to the brim, plus about 1/4 cup or so extra…. I’ve kept it with success for about a week in the refrigerator. Haven’t tried to see if it lasts longer, mostly because we eat it too fast. Also, see all those red specks in my mayo? Got a little pour happy with the cayenne. T’was a mistake I didn’t regret, although this batch did have some serious kick. 1. In a liquid measuring glass, measure 2 cups of light olive oil. Set aside. 2. Combine eggs, vinegar, and mustard in food processor with the metal blade attachment. A blender will work too if you don’t have food processor. 3. Pulse food processor 5 times so the eggs mix with the other ingredients. 4. Turn food processor on, and SLOWLY, and I mean SLOWLY pour olive oil into food processor while it is running. SLOW guys. Like painfully slow. It takes at least 2 minutes, maybe longer to pour olive oil in slowly. Slow. Got it? 5. You will begin to see the eggs and olive oil thickening, also called emulsifying, but keep going slow until olive oil is fully incorporated and desired thickness is achieved. 6. Turn food processor off, add in salt and cayenne, and pulse again 5 times to combine. 7. If you are going to add in various other spices and flavors, I recommend folding them into the mayo base with a spoon rather than adding them to food processor. The mayonnaise looses its thickness unless you are careful with add-ins. This entry was posted in Dinner, Gluten Free, Lunch, Paleo, Snacks and tagged eggs, erin, gluten-free, mayo, mayonnaise, olive oil, paleo by Flax + Honey. Bookmark the permalink.